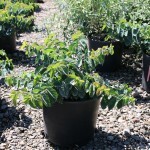 A low-growing, mounded shrub with blue-green foliage. The yellow-white flowers are followed by red berries. Useful in groups or for an irregular, low hedge. It prefers moist, loamy soils, full sun to part shade. 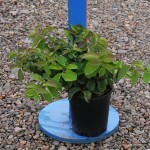 Use as a low hedge or foundation planting.